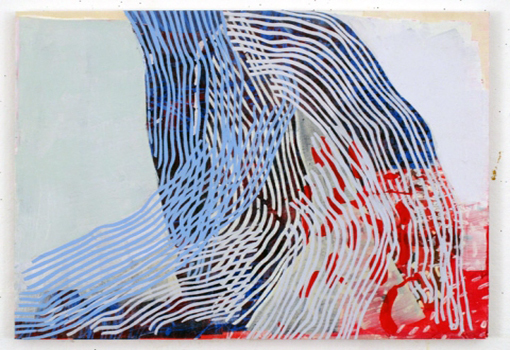 Fayer's paintings draw on various structures and systems to produce a loose geometry with organic rhythms. She relies mainly on her hand-crafted tools such as stencils and over-sized rubber stamps to construct her multi-layered paintings. As part of her process, she studies the natural and built environment; among her many references are architecture, aerial views of the landscape and language. Her attention to the wabi sabi aesthetic-- a Japanese concept of beauty that includes simplicity, unpretentiousness and imperfection-- reflects her experience of living in Japan for a few years as a child and young teenager. Laura Fayer is a painter living and working in New York City. Fayer is a graduate of Harvard University in Visual and Environmental Studies and holds an MFA in painting from Hunter College in New York City.